One sweet and a little sassy chocolate girl, Mavis, and 3 chunky, spirited boys, Billy, Charlie and Tank, ready and waiting for their new families. Vet-checked, dewormed, UTD on vaccines, microchipped and very socialized around lots of kid & adventures. These are stout pups and getting very nice big heads like their sire. At 9 weeks, a little bit older and easier to housetrain. They are doing great here. 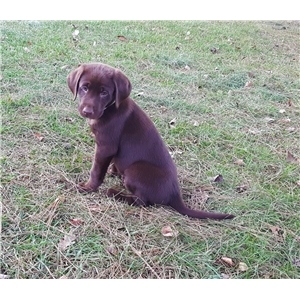 Very nice field pedigree, all dogs in 3 generations have some field title, parents and maternal grandparents are very much “known” dogs to me, that work well in the field, very trainable, good with people and live in the house. We don’t just breed “paper”, we know our dogs. Sire is my Ransom, Master Hunter and Qualified All Age. He is an awesome dog, period. Great in the field, loverboy with everyone. Excellent pedigree and health clearances. Clear by test: EIC/CNM/PRA/RD/OSD/CMS/Dilute. Copies on my website. Dam is Lady, JH. 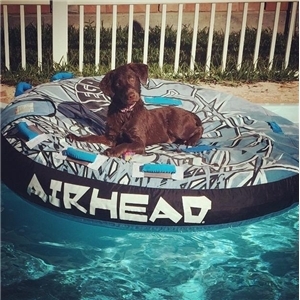 Daughter of my Dyna, MH/QA2 and Tim & Lauren Springer’s all around great dog, Dynamic Fisherman, MH/QAA. Lady is a lovely dog, wonderful family companion, just like her parents, and great in the field. Trainable and smart. These puppies have been raised with Lady’s family in their home in south Texas until 6 weeks of age. Due to complications after the destruction of Hurricane Harvey, they are here with me now to find their new homes. You’re welcome to meet their dad Ransom and granddam Dyna when you pick up your puppy. 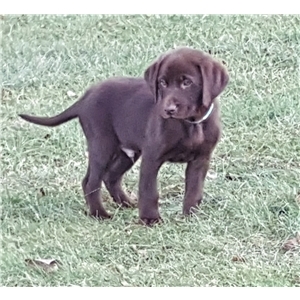 They will come with AKC registration, guarantee (available for viewing on my site), shot and worming record, microchip registration, food, toy and puppy guide. These puppies will be EIC/CNM/PRA clear via their parents. No known allergy or CCL issues either. $1000. Links to more info, clearances, etc on my website, www.rainmakerlabs.com.